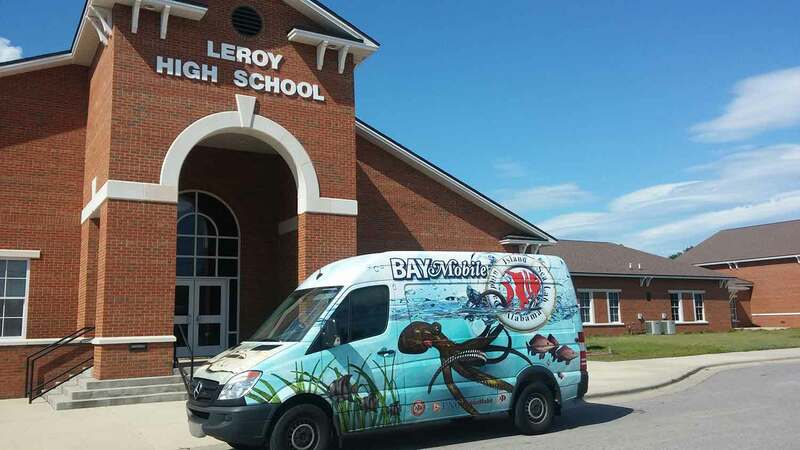 The Fisheries Ecology Lab at the Dauphin Island Sea Lab led by Dr. Sean Powers presents current research projects students and faculty are working in Mobile Bay, the Mississippi Sound, and the northern Gulf of Mexico. Each year, you can see the Fisheries Ecology Lab at work during the Alabama Deep Sea Fishing Rodeo held on Dauphin Island each year. Read more. Background: Greater amberjack are considered overfished in the Gulf of Mexico and recreational fishing results in a high rate of regulatory discard because of closed periods and length restrictions (SEDAR 2014). This species is targeted mainly by the recreational fishery (SEDAR 2014) and estimates of survival following discard are necessary for stock assessment. Most efforts to estimate discard mortality are based on initial observations of survival when fish are released. A recent study (Jackson et al. 2018) indicates the promising potential of acoustic telemetry to examine longer-term survival and behavior of released fish. Objective(s): The objectives of the greater amberjack project are to (1) estimate recreational discard mortality as a function of depth of capture, fish length, season, fight time, handling time and fish condition, (2) determine the contribution of predation to discard mortality, and (3) evaluate the efficacy of descender devices in ameliorating pressure-related fishing trauma and reducing discard mortality. Approach: To accomplish these objectives, we are using acoustic telemetry with multi-sensor (depth and accelerometry) acoustic transmitter tags (Vemco©). These tags allow us to infer the post-release fate of fish from behavior: alive, dead from predation, dead, or emigration from the reef. We are attaching transmitters to dorsal external tags (Figure 1) so that we avoid interfering with potential barotrauma effects to the swim bladder with surgical tag implantation. Fish will be tagged across a range of depths (30-60 m) so that we can test for potential depth and pressure related impacts on discard mortality. In addition, half of tagged fish will be released with a Seaqualizer© to determine if descending devices mitigate discard mortality in greater amberjack. Additional fish will be tagged with external tags to estimate discard mortality from traditional mark re-capture methods. Results to Date: In August 2018, 12 acoustic receivers were deployed on artificial reefs from 30 – 55m in depth. Twenty-three fish were tagged with acoustic transmitters and external tags. Recovery of acoustic telemetry data is planned for fall 2018 and additional fish will be tagged in early 2019. Data from this study will be used to build on the results of Jackson et al. (2018) and to improve estimates of discard mortality on this species in the Gulf of Mexico. Background: Ecosystem-based fishery management has evolved from an abstract concept to a broadly accepted tenet for effective conservation and management of marine resources. Despite this, fishery managers are increasingly tasked with gathering more fisheries-independent data to fulfill current, single species management objectives. Given finite resources, these two objectives are often in competition. The goals of the FI project are to provide a unique fisheries-independent survey design that fully addresses both ecosystem and single species management objectives in the northern Gulf of Mexico. 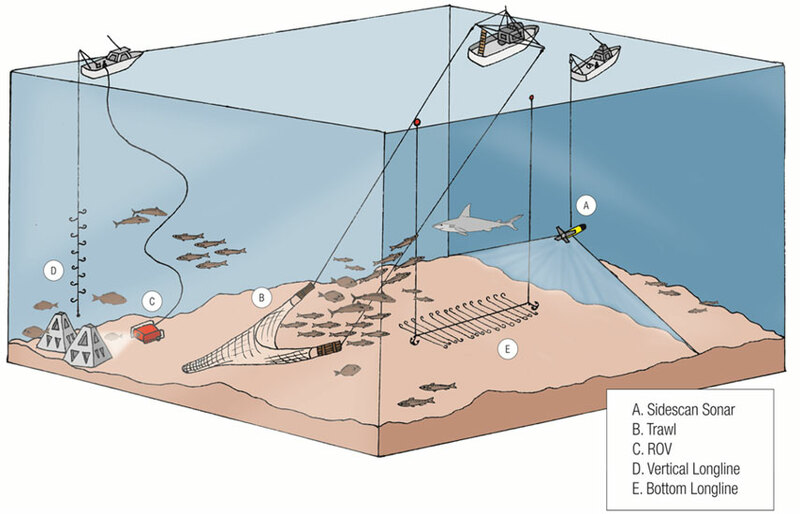 Illustration of ecosystem based approach to sampling reef fish communities. Objective(s): The objectives of the FI project are to (1) conduct a rigorous ecosystem-based assessment of reef fishes in the northern Gulf of Mexico, (2) examine the relationship between reef fish assemblages and habitat attributes (natural vs. artificial vs unstructured), (3) determine the selectivity of gear used in both fisheries-dependent and fisheries-independent surveys, including vertical longlines, bottom longlines, bottom trawls and video and (4) examine age composition of multiple reef fish species, particularly Red Snapper (Lutjanus campechanus). 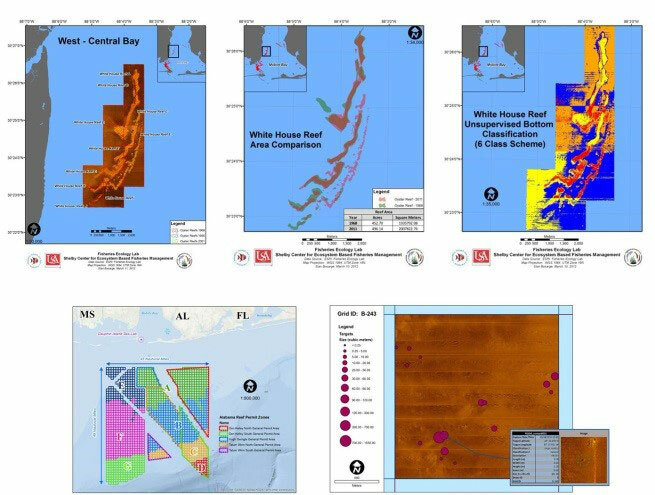 Approach: To accomplish these objectives, we’ve divided the Alabama reef permit zone, a large offshore area encompassing most of the inner continental shelf off Alabama’s coast, into 2km2 grids, creating a depth stratified random survey sampled with multiple gears. Following mapping of 36 randomly selected grids each year, synoptic sampling using vertical and bottom longlines, ROV and bottom trawls is conducted (Figure 1). Results to Date: Originated as a pilot project in 2010, FI sampling scheduled through 2020 represents our largest sampling effort to date. Information from this survey has been collected and used for stock assessment models; for example, indices of abundance and age composition from this project were included in the most recent assessment for Red Snapper during SEDAR 31. In addition, data from this project have been used to test the efficiency of specific gear types for sampling reef fish in the Gulf of Mexico (Gregalis et al. 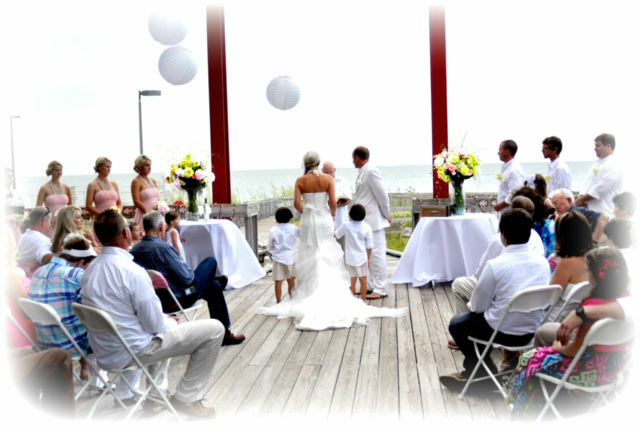 2012), as well as form the basis for several graduate student research projects and pending grant proposals. 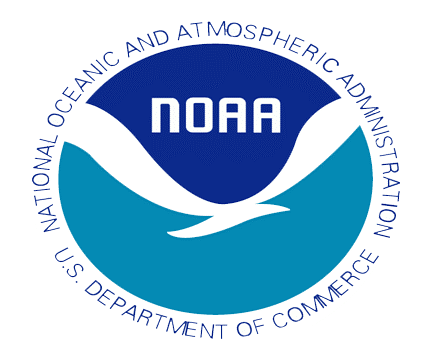 Funding Source(s): NOAA SEAMAP, NOAA MARFIN, ALMRD, and NFWF Wildlife Sportfish Restoration Fund, and DISL. Background: The otolith, or fish ear bone, is a stone like structure in the head of a fish mainly composed of calcium carbonate (CaCO3) (Figure1). It is a fish sensory structure that aids in orientation and detection of vibrations. It grows continuously throughout the life of a fish laying down annual rings that can be used to age a fish similar to tree aging. As a fish grows new material is deposited into the CaCO3 otolith matrix, and trace elements from the surrounding environment are incorporated into the otolith. 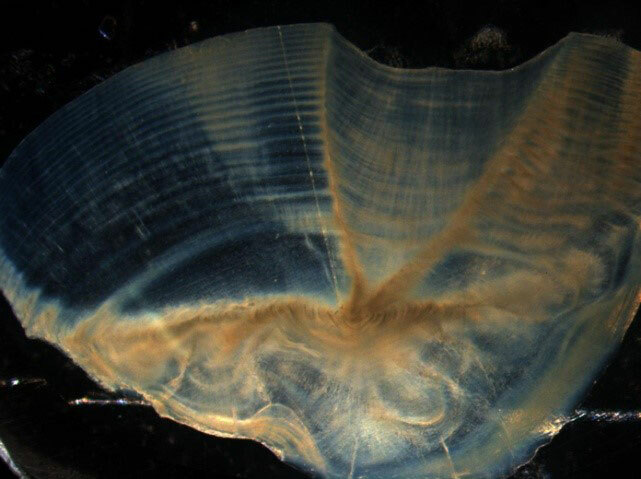 Unlike bone or tissue, which can be reabsorbed and reworked through metabolic processes in the fish, otoliths are metabolically inert, meaning that once trace elements are incorporated into the otolith they remain locked in the otolith structure throughout the life of a fish. Given this, retrospective tracking of fish movements, especially across salinity gradients is possible and determination of what age a fish experienced certain habitats is also possible. Estuarine obligate species use a variety of different water bodies with varying salinities throughout their lives and using laser ablation otolith microchemistry these age-dependent patterns of estuary use can be reconstructed. Knowing what habitats fish use and making sure these habitats remain viable and available is essential to the success of a fishery. Objectives: The objectives of this project are to (1) determine the timing, duration, and variability of estuarine residence of Red Drum (Sciaenops ocellatus), (2) identify different population contingents based on differing estuary use, (3) determine if certain salinities provide better growing conditions than others, (4) determine if one life history strategy is more successful than another contributing more recruits to the adult fishery, and (5) expand these techniques to other fish and possibly elasmobranch species. Approach: Laser ablation inductively coupled plasma mass spectrometry (LA-ICP-MS) is a technique which uses a laser to ablate material and carry it to a mass spectrometer via an inert gas (e.g. Argon). First developed for mineral analysis this technique has become quite popular in otolith analysis, given that the laser allows for chemical analysis in precise locations. This provides a great advantage over solution based mass spectrometry by allowing the correlation of fish age with trace elements experienced at that age. Based on concentrations of certain trace elements (e.g. Sr and Ba) at a given age it is possible to determine if a fish was in freshwater or saltwater, the duration of time spent in this habitat, and the point or points in a fish’s life that movements between these habitats occurred. This preliminary work will be one aspect of a graduate dissertation project that will improve our understanding of the ecology and movements of these estuarine dependent fishes. Background: The benthic habitat assessment program of the Fisheries Ecology Lab developed from a need to assess marine benthic habitats in an accurate and efficient manner. Using side-scan and single beam sonar, benthic habitats ranging from oyster reefs, seagrass beds, and artificial and natural reef structures have been mapped in the nearshore and offshore coastal areas of Alabama since 2007. 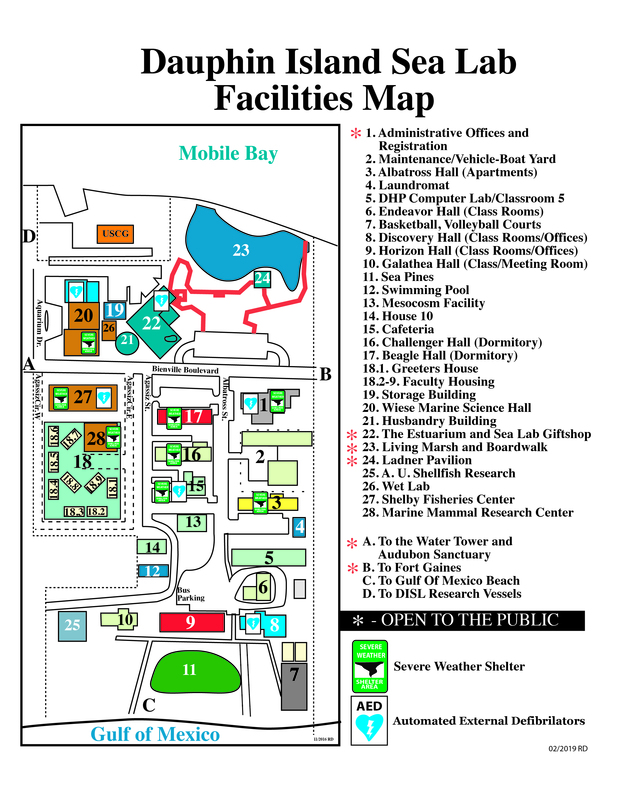 These data are used in support of a wide variety of research projects of the University of South Alabama's Department of Marine Sciences and the Dauphin Island Sea Lab. Objectives: The objectives of the program are to collect and analyze sonar data to create detailed benthic habitat maps and reports as well as produce spatial data consumable by a variety of geographic information systems (GIS). Project parameters vary, but include pre and post oyster reef construction assessment, seagrass bed delineation, and offshore reef location and density estimations. Approach: The side-scan is used to create georeferenced mosaic images of large areas of the sea floor while the single-beam is utilized to provide depth readings and water column fish echo detections during the course of the survey. The data collected from these systems are used in target detection, base image creation and bottom classification (Figure 1). All data collected are stored, managed and disseminated via a geographic information system (GIS). Results to Date: During the course of this work, nearly 70 km-2 of bottom was mapped. The offshore assessment work continues, and at this point, 347 km-2 of seafloor has been mapped within and around the Alabama Artificial Reef Permit Zones. From this effort the locations of approximately 17,409 individual reefs have been determined. The offshore assessment effort has proven to be essential in providing the sampling framework for the Fisheries Independent Survey of the Fisheries Ecology Lab. Funding Sources: NOAA SEAMAP, NOAA MARFIN, ADCNR, DISL, and NFWF Wildlife and Sportfish Restoration Fund. 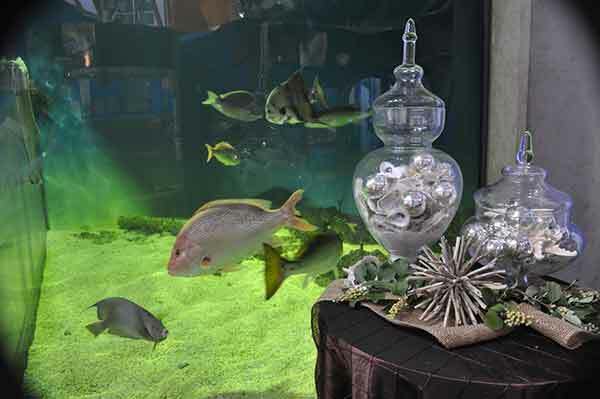 Background: Red Snapper is an economically significant fish in the Gulf of Mexico. However the species is currently overfished and extensive efforts have been put towards developing models to estimate stocks and develop management plans. Recreational fishing mortality is a significant component of these models and can be difficult to estimate. 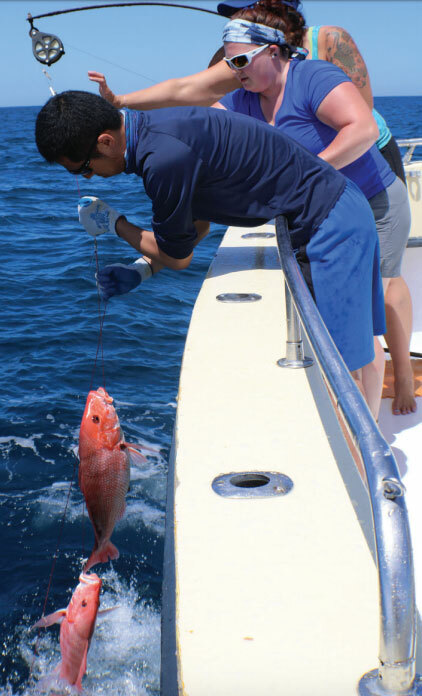 To increase the accuracy of these estimates, a high dollar red snapper tagging program was put into place. Objectives: The objectives of the high dollar red snapper tagging program are to (1) tag enough red snapper in the Alabama Artificial Reef Permit Zone (AARPZ) to accurately estimate recreational fishing mortality in the AARPZ and (2) to use this estimate of recreational fishing mortality estimate in models to assess red snapper populations in the Gulf of Mexico. Approach: To accomplish these objectives, teams will randomly tag 750 legal sized red snapper every year throughout the AARPZ. Each tag will be worth $250, allowing us to assume that 100% of the tags caught will be returned. Some fish will receive two tags so that we can calculate tag shed rate. 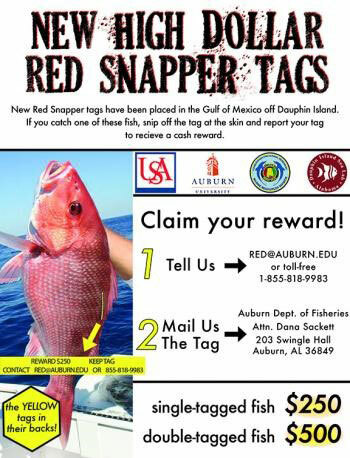 All red snapper will be released using a sequalizer and action cameras to ensure that the fish are released unharmed. A separate team will then receive calls from fisherman who catch the tagged fish and use that information to create an estimate of recreational fishing mortality. Results to Date: In 2016, we tagged 724 Red Snapper. 84 of those fish were recaptured and reported during the 2016 Alabama state recreational season. Tag shedding rates have been determined to be very low. 443 Red Snapper were tagged in 2017 and 535 Red Snapper 2018 with plans on tagging Triggerfish in 2019. 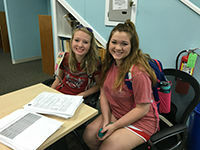 Funding Sources: DISL, the University of South Alabama, Auburn University, the Alabama Department of Conservation, ALMRD, and National Fish and Wildlife Foundation. 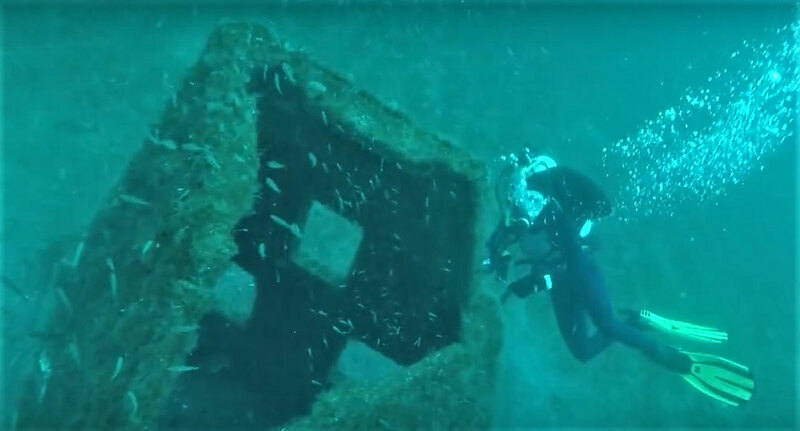 Background: Artificial reefs are often used to increase fishing opportunities, particularly in areas like the Northern Gulf of Mexico, where natural reef habitat is limited. Yet, the ecological and fisheries benefits of such reefs remain a topic of debate. Reefs could serve to attract animals away from nearby habitats, aggregating them in known locations and thereby making them easier to catch. Reefs could also increase habitat availability and/or food resources resulting in increased production. 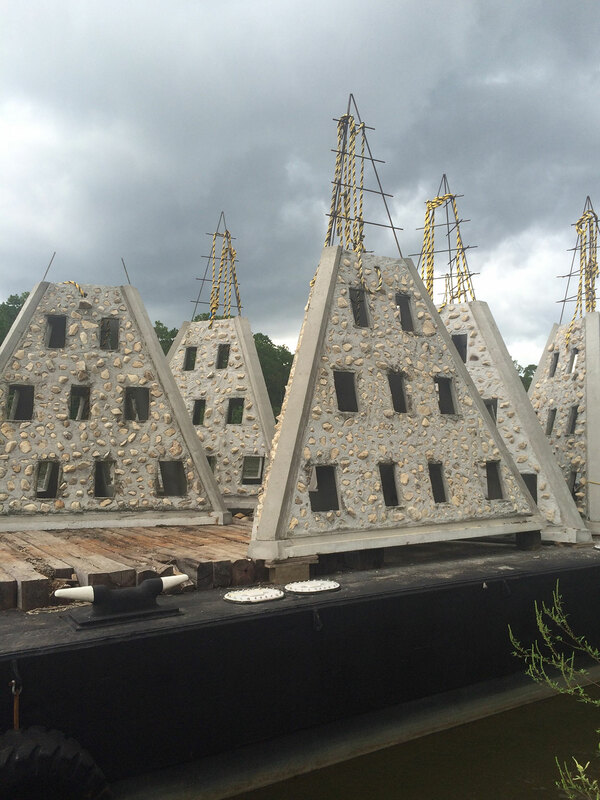 The Alabama Department of Conservation and Natural Resources Marine Resource Division has recently deployed a large number of new artificial reefs in the inshore and offshore waters of Alabama. These reefs have been added to an extensive existing network of artificial reefs to enhance nearshore fishing opportunities and increase the amount of high-quality habitat available for important fisheries species such as Red Snapper. Objectives: We use fisheries-independent survey tools to assess the degree to which these new artificial reefs increase fishing opportunities and potentially result in increased fishery production. We quantify and monitor fish and invertebrate population structure and community composition through time, in different locations, and on different reef types. Working in conjunction with researchers in the Cebrian lab (DISL) whose primary focus is monitoring primary productivity on the new reefs, we hope to elucidate the links between primary production and fish production in order to shed light on the attraction-production debate and to determine whether the new artificial reefs are having the desired fishery enhancement effects. Approach: We are using a variety of standardized fishery-independent techniques to sample a subset of the newly deployed reefs. Survey tools include ROV video, vertical longline, sabiki rigs, traps, gill nets, and direct diver observations. In concert, these tools will allow us to quantify the relative abundance and biomass of a variety of species on the various reef types across depth strata and through time. Results to Date: Baseline fish and invertebrate sampling was initiated in Spring 2016 and a surveys (post-deployment) were completed seasonally through in Fall 2018. Initial results indicate that while abundance, biomass, and diversity of fishes and invertebrates remained low through the Fall sample period, all of these metrics increased markedly between the baseline surveys and the first round of post-deployment surveys. We have seen numbers, biomass, and diversity of fishes and invertebrates to continue to increase over the past two years. Initial primary productivity sampling (Cebrian lab) was conducted in late 2016 and will also continue through the end of 2018. Funding Sources: USA, ALMRD, DISL, National Fish and Wildlife Foundation. Background: Red Snapper is one of the most economically important fisheries in the Gulf of Mexico. The species is currently overfished and extensive efforts have been put towards developing models to estimate stocks and develop management plans. Even though we have seen an increase in population as a result of these management plans, the spawning potential is lower than the rebuilding target. Further research is needed to accurately assess the population. Objectives: The objective is simple, to independently estimate the abundance of red snapper in the Gulf of Mexico. To achieve a Gulf-wide abundance count, 21 talented multidisciplinary investigators have come together to tackle this issue. 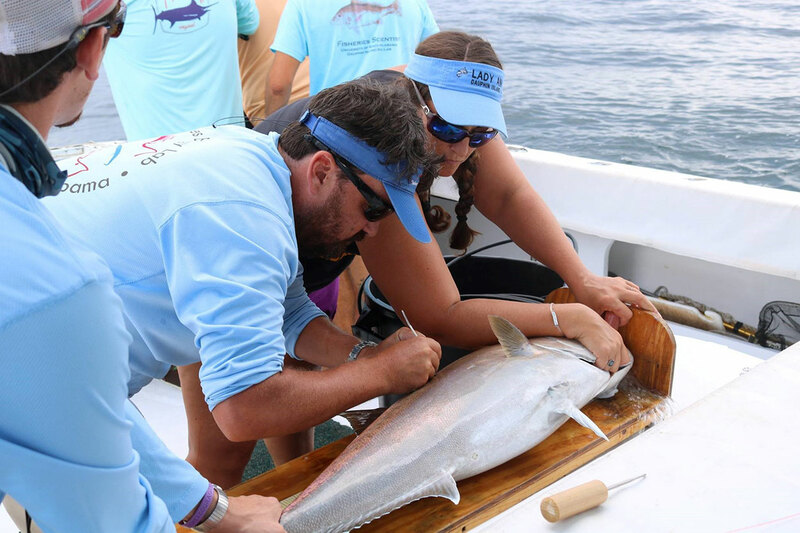 Approach: To accomplish these objectives, habitat classification, direct visual counts, a high-reward tagging study, and depletion surveys are being conducted across the Gulf. The Gulf of Mexico waters were divided into four separate regions: Texas, Louisiana, Mississippi-Alabama, and Florida, The Fisheries Ecology Lab is focusing on the Mississippi-Alabama region. Side-Scan Sonar surveys will be conducted to determine habitat classification, remotely operated vehicles (ROV) will be used for direct counts, vertical longline sampling will be conducted for depletion surveys, and a high-dollar tag return program will be set in place. Results to Date: Side-scan sonar surveys showed that pyramids and chicken coops were the main forms of habitat in Mississippi-Alabama waters. This information helped scientists decided which sampling gear for depletion surveys would be appropriate for our region. Red snapper is currently being counted to determine density estimates with from ROV videos. Vertical longline sampling and the high-dollar tag reward program have been set in place and sampling will continue through 2019. For more information and a complete list of research organizations involved, visit https://www.harteresearchinstitute.org/snappercount. Funding Sources: This project is funded by the U.S. Department of Commerce’s National Oceanic and Atmospheric Administration and the Mississippi-Alabama Sea Grant Consortium. Background and summary of approach: The study of population connectivity and subdivision is vital to the proper management and conservation of species and furthers the study of evolutionary biology and ecology. Sheepshead, Archosargus probatocephalus, are a euryhaline sparid fish that are ecologically, commercially, and recreationally important in the southeastern United States 1. Population genetic data (microsatellite genotypes) indicate genetic divergence in sheepshead across the tip of the Florida Peninsula and both morphologic and population genetic data indicate divergence across Apalachee/Apalachicola Bay in the Florida Panhandle 2. 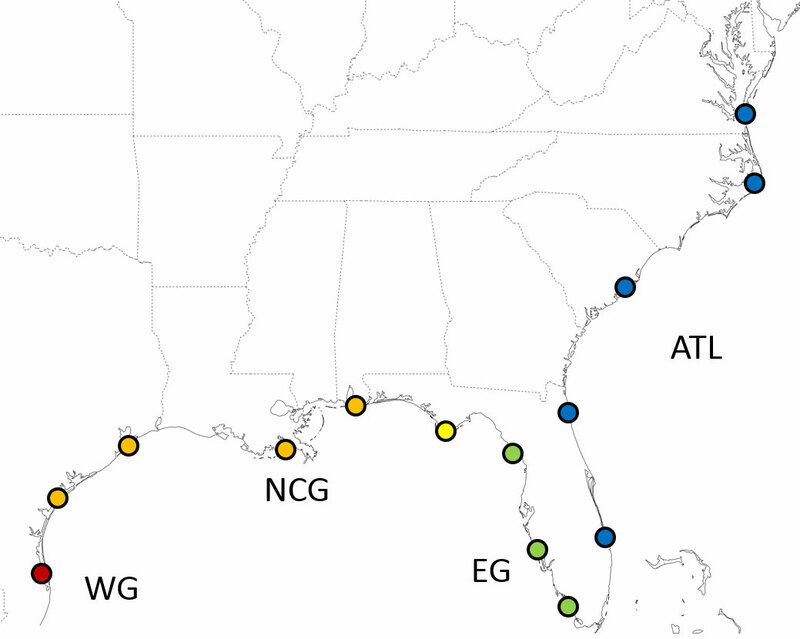 Divergence across Apalachee/Apalachicola Bay is not proximal to any known hydrographic barriers and may be maintained by divergent selection between the divergent environments/ecosystems of the fresher, turbid, and more productive north central Gulf of Mexico coastal waters and the salty, clear waters of the west coast of the Florida Peninsula. In collaboration with the Marine Genomics Laboratory at Texas A and M University Corpus Christi, we aim to re-examine sheepshead population structure using reduced representation genomics and more extensive geographic sampling to increase the resolution of neutral population structure (Figure 1) and make inferences on patterns of selection by partitioning out putatively selected loci using multiple methods of genomic outlier detection. Sheepshead are euryhaline in that they are found from the offshore marine environment to the freshwater tidal reaches of rivers 1. Otolith chemistry has previously been used to describe salinity residency in euryhaline fishes as well as partition out potentially distinct life history contingents of a population within an estuary in terms of salinity residency 3-5. We aim to use the salinity tracers of Sr/Ca and Ba/Ca, coupled with experimental validation and water sampling, to make inferences on salinity residency in sheepshead sampled in Mobile Bay in the north central Gulf of Mexico as well Apalachicola Bay, which is within an introgression zone between the north central and eastern Gulf of Mexico sheepshead populations. As genomic data will be available for all these individuals, we will be able to examine not only whether or not there are distinct life history contingents in sheepshead but also whether or not there is any covariance between genomic data and apparent patterns of salinity residency in both an introgression zone and a single deme of sheepshead. (4) Determine if there is any covariance between salinity residency and genomic data within an introgression zone and a single deme of sheepshead. Results to Date: Genomic analysis reveal strong patterns of population structure with complementarily strong patterns of putative directional selection across the range of study for sheepshead. Otolith chemical data are currently being collected. Vanderkooy SJ (2006) The Sheepshead Fishery of the Gulf of Mexico, United States. Gulf States Marine Fisheries Commission, Ocean Springs, MS.
Seyoum S, McBride RS, Puchutulegui C, Dutka-Gianelli J, Alvarez AC, Panzner K. (2017). Genetic population structure of sheepshead, Archosargus probatocephalus (Sparidae), a coastal marine fish off the southeastern United States: multiple population clusters based on species-specific microsatellite markers. Bulletin of Marine Science, 93, 691-713. Walther BD, Limburg KE (2012) The use of otolith chemistry to characterize diadromous migrations. Journal of Fish Biology, 81, 796–825. Nims MK, Walther BD (2014) Contingents of southern flounder from subtropical estuaries revealed by otolith chemistry. Transactions of the American Fisheries Society, 143, 721–731.